June 7, 2018, 4:06 AM · Even though fingers look beautiful when they assume the left-hand position on the fingerboard, they’re not designed to look like that. Violin teachers try everything imaginable to set up a primitive template that helps children make sense of intonation and hand placement: stars, bars and marks-a-lot fixed on the fingerboard, commercially designed “rulers” that you can tape on, unattractive appendages that try to keep the wrist from touching the violin’s neck, etc. We’ll do anything to play in tune, and fingerboard graffiti show us where our fingertips go. We use whatever talent we have to give us a clear picture of what actually happens when two incompatible shapes, the left hand and the violin neck, become one. However, there’s a blind side in each of us that causes various problems, like the hand collapsing when it changes string, or not moving the hand a little BEFORE the finger moves. The more we understand how things actually work and why things break down, the more our talent grows. Since our fingerboards don’t have frets, there’s an implicit invitation to slide from half-step to half-step. Beware such an invitation. The resulting sound is not just bad intonation, but bad rhythm. One of the paradoxes that music and violin playing is so (in)famous for is that the bow moves smoothly while the left fingers are more machine-like, precise and structured. 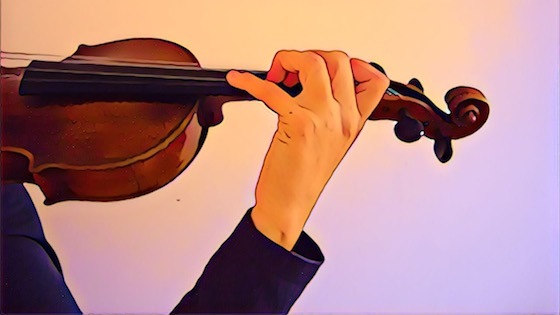 If the bow movement is smooth and unflappable, you can move one finger a half-step, whole step, or any interval for that matter, and make it sound legato. The trick is to place the finger inside a very precise, centered orbit, on the correct pitch. The lurking danger is that fingers tend to waffle and gravitate to other areas, and orbits bleed into each other and co-mingle rather than retain their independence and identity. Fortunately, there is a teaching tool for this tricky movement. The socket wrench illustrates how fingers move and click into place. Even though the concept sounds stiff and metallic, it combines elements of uniform rhythm and mechanical reliability. These qualities are so essential in musical performance, but not easy to describe in words. Just as a picture is worth a thousand words, the right image or analogy can help us unlock the mystery of the technique. A socket wrench has a ratchet mechanism, and this reminds us that there are no short cuts when it comes to physical dexterity. While half-steps may seem like the baby steps of the violin, it is just as important to measure them as it is larger intervals. The most common mistake when shifting a half-step with the same finger is that the finger doesn’t move far enough. Don’t worry that all this talk of clicks and mechanical movements of the left fingers will result in a dry, percussive quality. Here is where the bow arm performs two miracles. It maintains an even and smooth sound from one stroke to the next, and provides a boost to the confidence of the left hand. The number-one cause of a faulty shift is the lack of support from the bow arm. All those rote exercises we did as beginners do pay off. Our mechanically trained left finger movements will produce precise pitches, evenly spaced; our bow arm engages the constantly vibrating string, which provides a beautiful texture on which the notes will thrive. While the fact that these movements, which have little in common with each other, are the bane of our existence, the achievement of having them work together is one of the human miracles upon which music is based. June 7, 2018 at 06:38 PM · Might seem a bit silly, but perhaps learn the cello first. That will strengthen everything to at least the level required for violin playing, and more. Another alternative is to learn the piano (a real one with hammers and strings, not electronic) to the level where you can work on intricate left-hand material. Getting finger and hand strength will not of itself enable accuracy on the fingerboard but will give the basic muscular strength and control to be able to attain that accuracy of finger placement a little more easily with practice. June 7, 2018 at 09:54 PM · Your last sentence is sheer poetry! Beautiful. Can you address the phenomenon that sometimes half steps seem larger ascending than descending? June 8, 2018 at 07:56 AM · Very good post. I think the socket wrench analogy is excellent and could be discussed in more detail! June 8, 2018 at 12:25 PM · 87, you bring up an interesting topic. Distances on the violin don't change. A half step, whether you're going up or down, will remain the same. But our perceptions undergo radical change. Suzuki devoted an entire book. Quinten. to this phenomenon. He observed how students misjudge first position on the various strings. This world of "relativity" is one of the most fascinating topics of violin playing. It applies to rhythm as well. Beats stay the same, but they play tricks with our brain. June 8, 2018 at 05:27 PM · 57, The socket wrench is described very well on Wikipedia, for those who would like to see a photo. The bumpy, ratchet motion is applicable to finger movement on the violin in that it eliminates the tendency for the finger to vacillate, meander and equivocate. Nothing spells rhythm like a ratchet. When moving the finger through different positions, don’t forget to move the whole hand with it. Don’t forget the thumb either. June 9, 2018 at 07:10 PM · My advice to students when playing the (there's only one!) chromatic scale in first position; Don't start in half-position, use 1st finger extension instead. Play half-steps with adjacent fingers tight. Play half-steps with the same finger slightly wide. It seems to improve the intonation every time. The half-steps in first position are about the same as width of my finger- tips -- 5/8 inch or 12 mm. June 10, 2018 at 12:03 AM · Joel, These are excellent suggestions. It helps for the ear to get used to the pitches in a chromatic scale. They are just as clear and unique as those in a regular diatonic scale. Measuring your finger's width was a good idea.